It's strange to think of an elegant snail. It's even stranger to think of a flying snail. Okay, the Sea Butterfly doesn't really fly, not in the air or anything, but it does swim in the sea in a manner that looks quite a lot like pleasantly tranquil flight. They are found all over the world's oceans, most of them near the surface with less and less as you go deeper. Most of them have a thin, transparent shell, which I guess is very lightweight and is only about 1cm across. These are usually still calcified for whatever strength they can manage, but some are more cartilaginous and other Sea Butterflies don't have much of a shell at all. Regardless, they are all very delicate and even dainty little animals. The foot of the Sea Butterflies has become a large pair of wings which are used to flap or soar in the water. They are very slow moving but it really does look like they are doing all the fluttering and gliding of their insect namesakes; from vigorous wing thrusts to the serenity of floating with the currents, it all looks wonderful! I'm not so sure about their table manners, though. When a Sea Butterfly wants to eat, it starts by secreting a web of mucus. This thing is about 5 cm across, bigger than the actual snail! Bits of plankton stick to this disgusting platter (I wonder if it glints in the Sun and looks silver, too?) 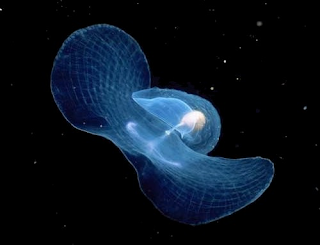 and the Sea Butterfly can then just eat the whole lot, recouping its lost mucus and gaining lots of little specks of grub. They will also follow plankton populations as they move to the relative safety of deeper waters by day and toward the surface at night. 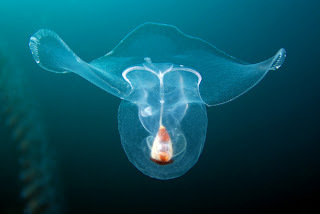 Not much more seems to be known about Sea Butterflies. They are so small and difficult to see, so fragile and difficult to catch alive - although quite a lot of animals aren't that bothered about the "alive" bit. These humble snails can sometimes form swarms that provide food for fish, birds and even whales. All the more unfortunate then that ocean acidification may lead to the extinction of the shell forming ones. I really hope that doesn't happen. They show that even snails can be beautiful and mesmerizing, even if their eating habits, while probably equally mesmerizing, are just a bit wrong. Ha! Oh yeh, of course. I know I keep all MY classic art in a big bath of sea water, and so should you. What kind of things do the sea butterflies eat? Tiny plankton and stuff drifting around in the sea! Bald as a Coot. More so, in fact.